Hi! 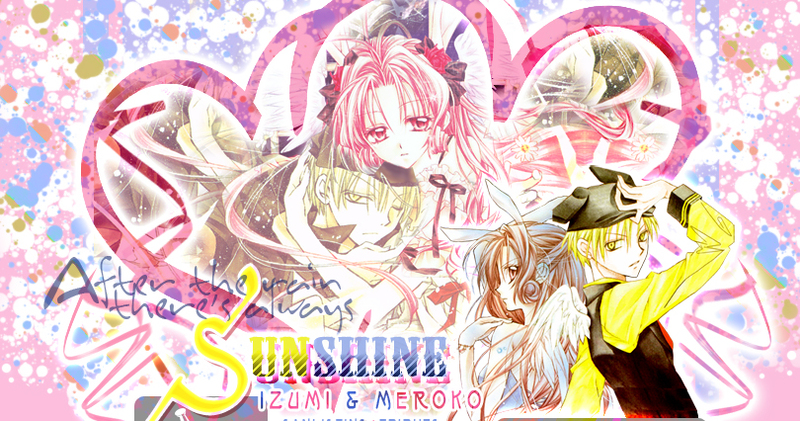 Welcome to "After the rain there's always Sunshine", the TAFL approved fanlisting for Yui Meroko & Izumi Lio , two of the amazing protagonists of the series Full Moon wo Sagashite, created and illustrated by the great Tanemura Arina! Meroko and Izumi are my favourite characters since always, I totally adore their personality and their development of the story! They're not a canonic couple since at the begin they're not conscious of the feelings for the other and just at the end they understand that they're in love, they always were in love since the first mission as shinigami. Meroko and Izumi share a sad past made of death, but now the have the chance to be happy together, facing the eternity with optimism. This fanlisting is originally owned by the cute Liz , that let me adopt it out in August 2009! Thank you very much, I'll take care of it forever!! Please, choose a link from above to fully access the site, and if you're a fan of Meroko and Izumi, feel free to join their fandom! Full Moon wo Sagashite is the property of Tanemura Arina, all rights reserved. This is a fan-site, I don't intende to violate them. Layout & contens ©Dorothy. Do not reproduce.